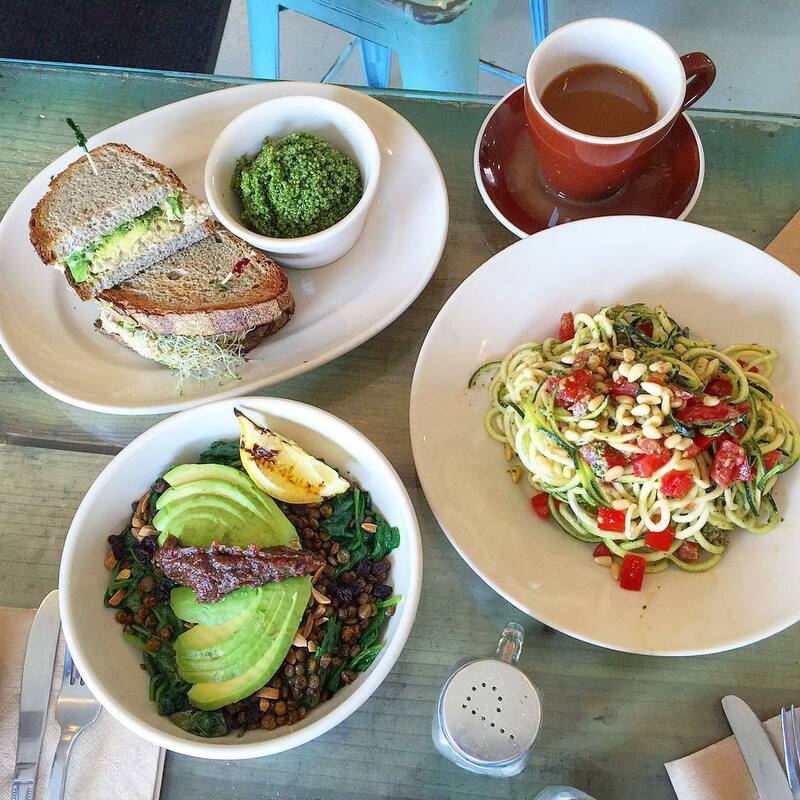 We've hand-picked all of your best lunch options across LA. When the clock strikes lunch o'clock in Los Angeles, we all too often find ourselves turning to the vending machine, Baja Fresh or cobbled together leftovers from our half-assed dinners the night before. But we will not stand for these mediocre lunches any longer! We, the hard-working people of LA, deserve better than Cliff Bars and peanut butter sandwiches, especially when there are handfuls of cracking lunch options, often under ten bucks, and in closer range to your office or the coffee shop where you hold residency than you think. 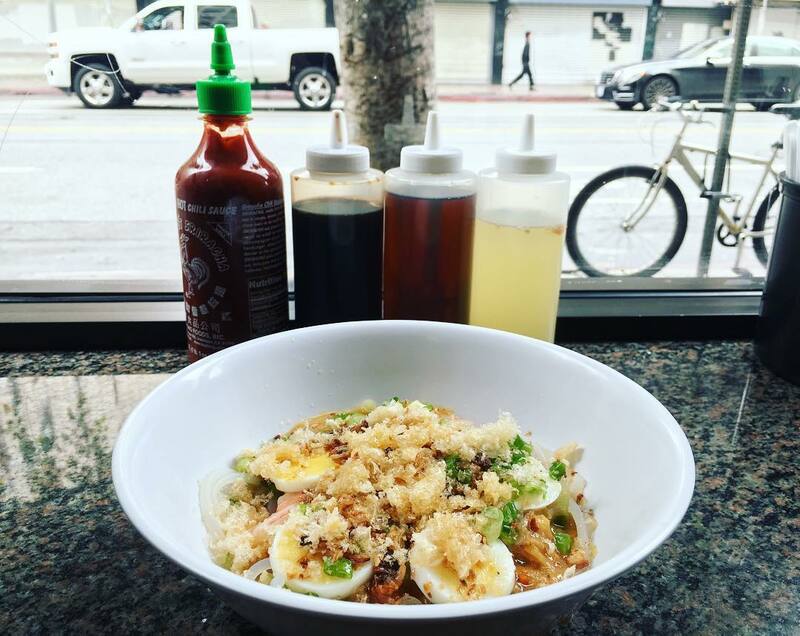 Whether you're in Pasadena, Venice or anywhere in between—we’ve mapped out the best quick lunch spots across the city. Just navigate to your hood below and bust a move. 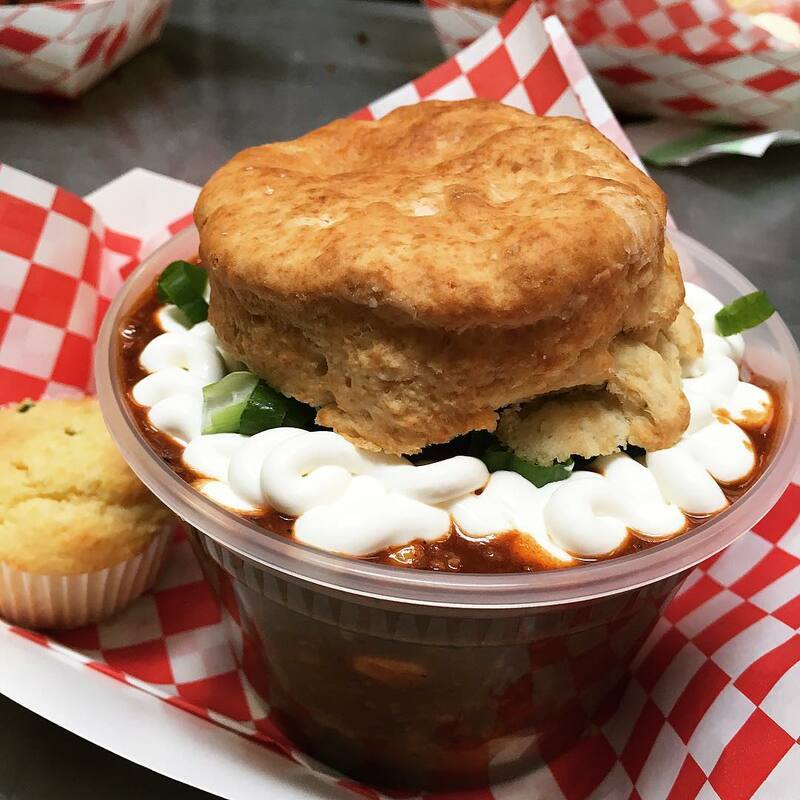 Thyme is a dependable and charming order-at-the-counter neighborhood spot that boasts a delightfully affordable gourmet menu. 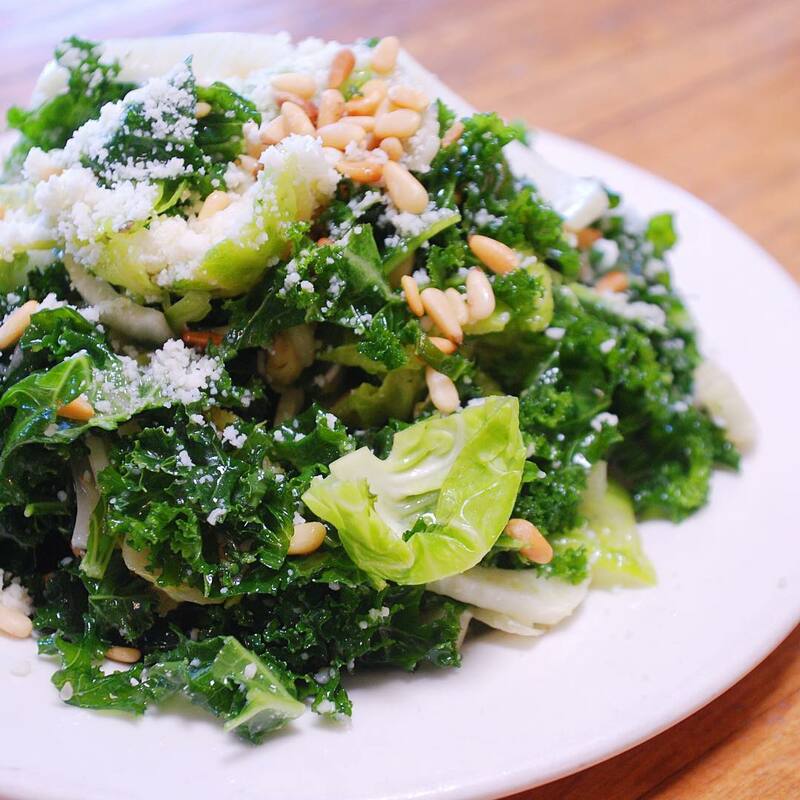 How about a chopped Chinese chicken salad with kale, brussel sprouts, pecorino and pine nuts? Maybe a steak and watercress sandwich with caramelized onions and horseradish aioli? Don't mind if we do. 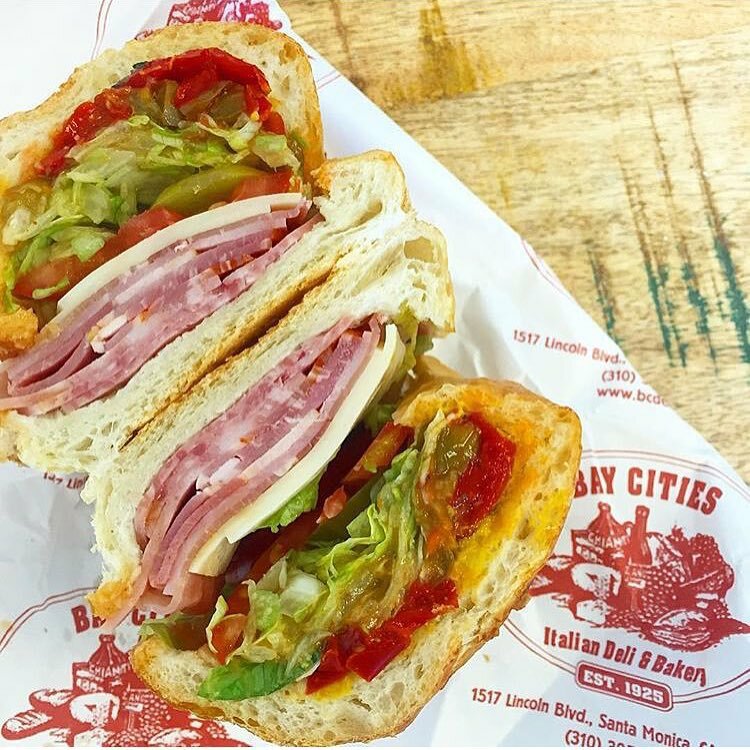 If you come to LA and haven’t had The Godmother from Bay Cities, have you even been to LA? While The Godmother with the works is an absolute classic, don’t sleep on the meatball sub, caprese, or a classic turkey and cheese sandwich either. What we’re really trying to say is: The bread here makes the sandwich, so buying a baguette in addition to a sandwich is a must. For those of you who like your sandwiches roasted and toasted, the Carvery Kitchen is the perfect casual spot to scarf down a juicy dip sandwich. They also have homemade soups, open-faced crispy tortilla sandwiches, wraps, salad bowls and all that good lunch stuff. Nothing like a Mongolian Pulled Pork Dip with Carolina BBQ sauce to combat that icy ocean breeze. Tucked into the Bergamot Station (once a stop on the Red Line trolley), Bergamot Cafe blows our standard museum cafe expectations out of the park. Have just one bite of the chicken pesto sandwich and you’ll find yourself returning once a week to satisfy the craving. If you’re in need of some greens, the taco Caesar salad and and the mint lemonade (it’s green, OK?) will not disappoint. Don’t forget to check out some of the galleries and the gift store—one of the best in LA—on your way out. Little sister of famed Gjelina, Gjusta is a bakery/deli/cafe offering up somewhat fancier lunchtime fare. It may be pricier, but the quality is worth the extra few bucks. Cheeseburgers on seeded pain de mie buns with gruyere cheese, porchetta melts, Aspen Ridge prime rib butcher sandwiches and chicken dumpling soup are all on the menu. Or go wild and design your own fish sandwich (it has it’s own menu!). If you don’t feel like eating your $20 lunch on a milk crate outside, take it to-go and slurp that kale smoothie down on the beach a few blocks away. A Japanese emporium with quite possibly the best food court west of the 405, Mitsuwa is a Japanese foodie’s heaven. Hit up Misasa for Donburi bowls, Santouka Ramen for ramen, Hannosuke for crispy tempura specials, Sanuki Sandou for Udon bowls or Mitsuwa Marketplace for freshly sushi. If your boss is out of town, you can even rent a movie from the old school video store to watch on your laptop after lunch. Fat Sal’s claims 40 unique sandwiches and takes its name very seriously. 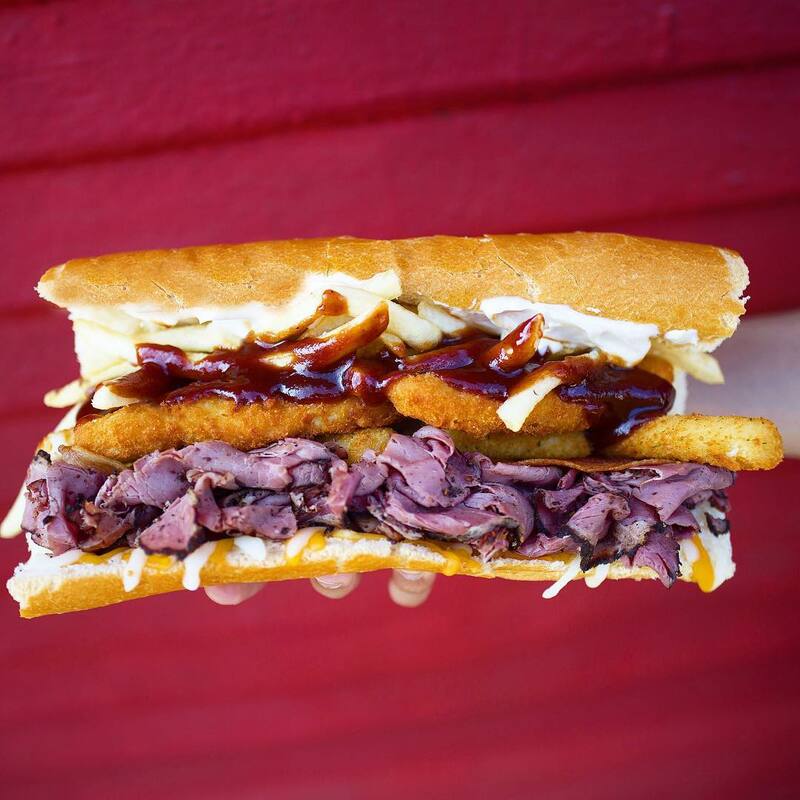 Case in point: The Fat Texas—crammed with BBQ pastrami brisket, chicken fingers, mozzarella sticks, crisp bacon, grilled onions, fries, melted cheddar and mozzarella. If you’re instead seeking something light and healthy … better go somewhere else. This one’s for when a true zero fucks meal is in order. 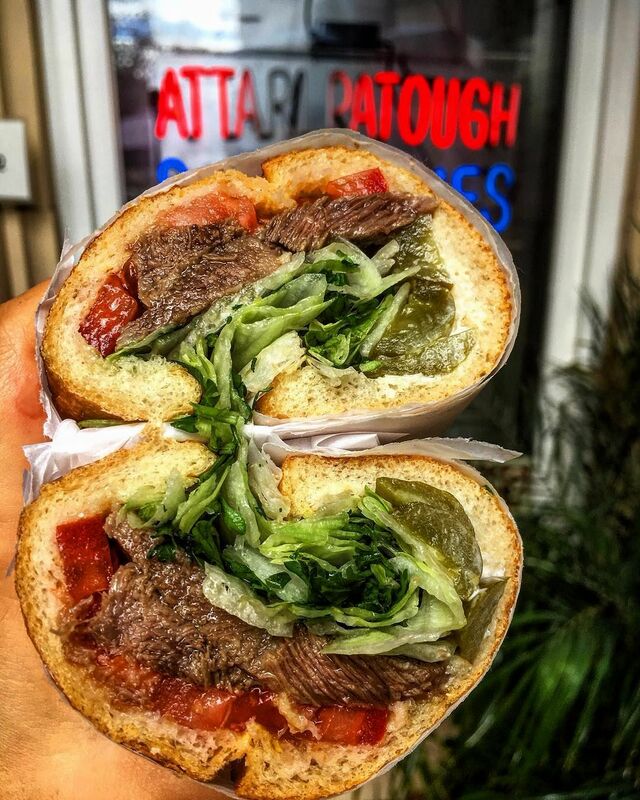 You can’t go wrong at this little Persian sandwich shop, but we’d be leading you astray if we didn’t tell you that the beef tongue is an absolute must. If you’re too lame to put some taste buds on your taste buds, try the also-popular Sosis (sausage) sandwich, grab a koobideh kabob sandwich, a soup, stew or full dinner plate. The outdoor patio has a pleasant fountain where you can catch some rays. Need we say more? Good stuff, indeed. This burger joint is one of those places that takes you back to a simpler time of burgers, fries and totally competent cashiers. 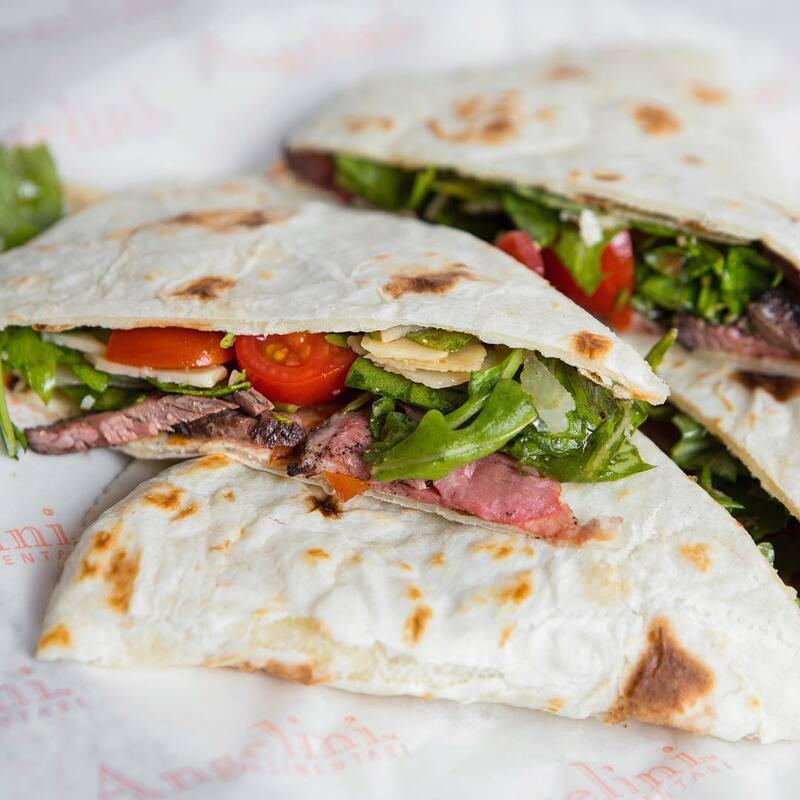 We like the mushroom swiss burger, but the sandwiches, wraps and crunchy stuffed pitas also do the trick. 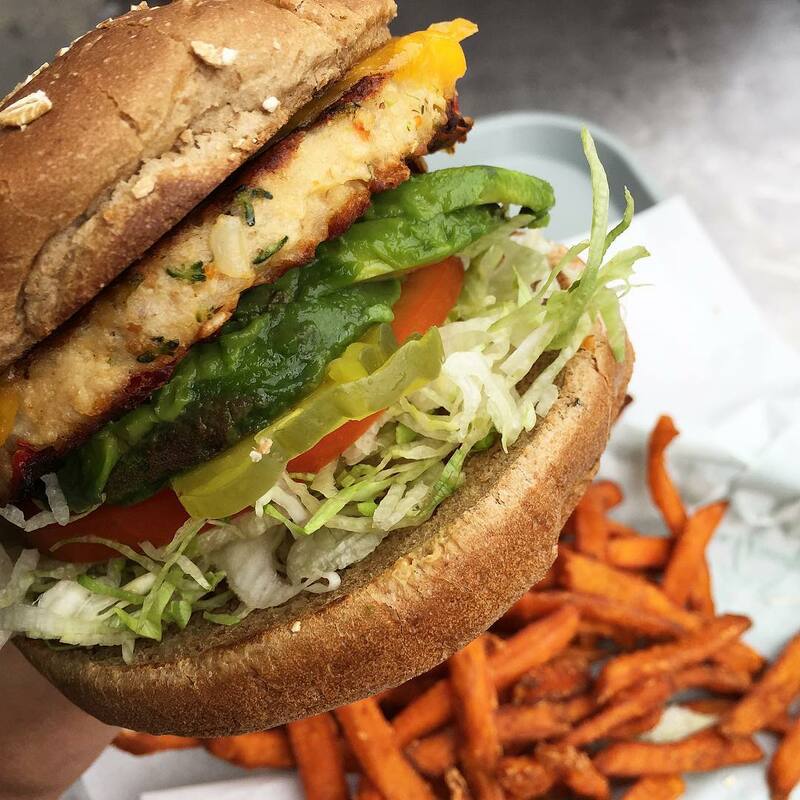 They’ve also got turkey burgers and four types of veggie burgers. Try out the Southwestern chicken salad and zucchini parmesan fries. Hidden on a small residential street, Jackson Market and Deli feels like an old local grocery store where everyone knows your name and all of your dirtiest secrets. Sandwiches, salads and wraps are all under $10 but not lacking in substance — there’s a large menu that features old fashioned reubens, fattoush salads and chipotle wraps as well as plenty of deli meats and cheeses. Need to work through lunch, but also need to get out of the office? Head to Vinoteca at the Four Seasons for some fresh air and a montanara or an arancino. Request to sit outside on what some of us are calling the Power Patio where every table is equipped with outlets out the wazooo. The best bit? You can dine here among celebrities without breaking the bank with its upscale but affordable Italian street menu. 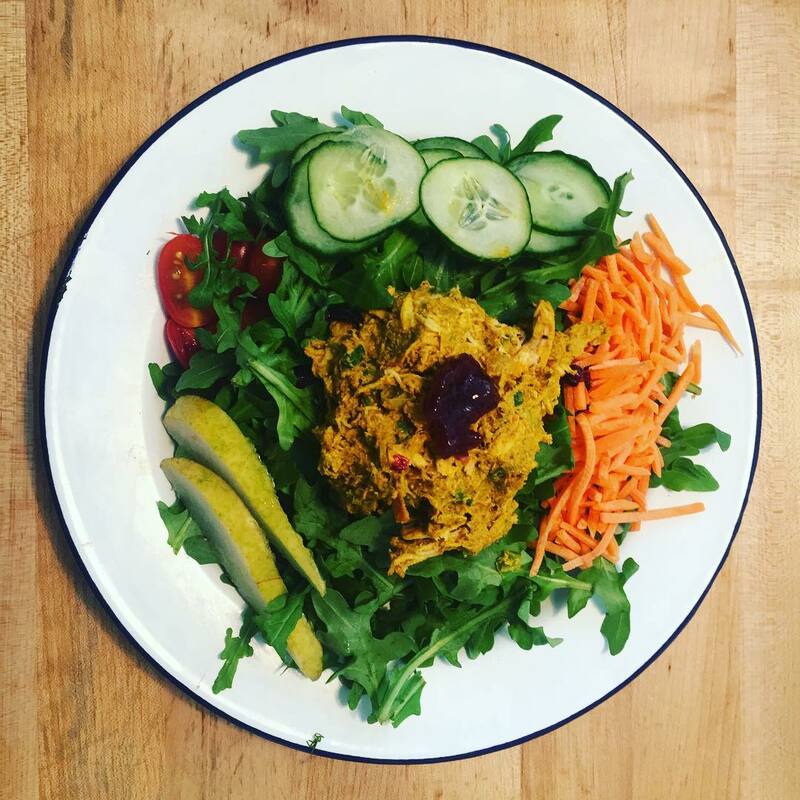 Honestly, you could come here for lunch and be satisfied simply with an incredible smoothie, but Beaming also offers daily soups, salads and entrees that vary from coconut ceviche, raw vegetable lasagnas, salads and plenty of gluten- and dairy-free baked goods. Totally organic and owned by a mother-and-son team, FoodLab is the cozy neighborhood cafe we all need in our lives. 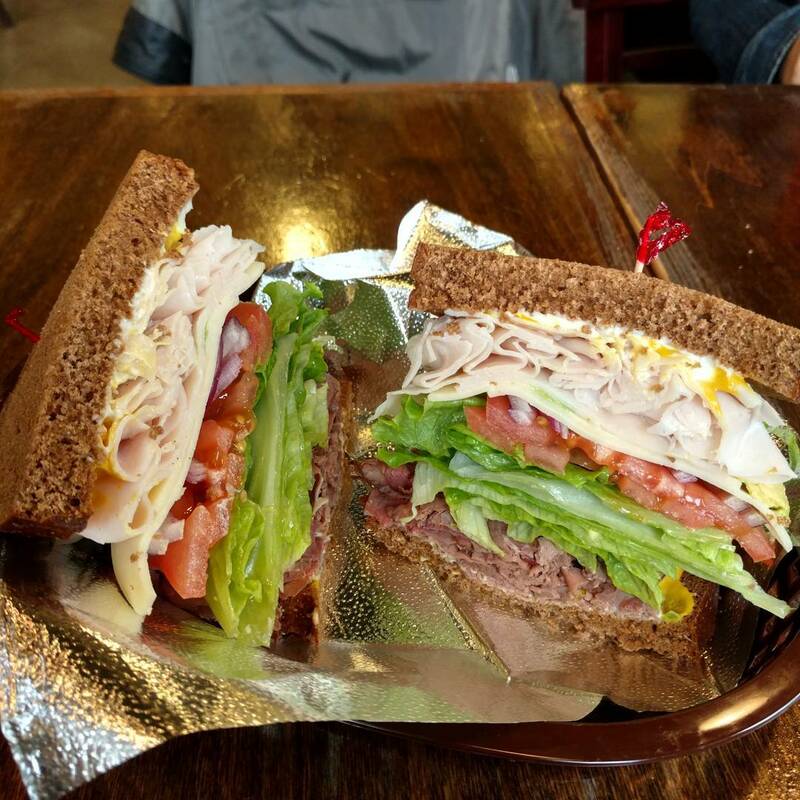 Order gourmet Austrian meatloaf sandwiches, veggie goat cheese salads, tuna melts, turkey cobbs, and breakfast fare from the counter up front and then sit out on the patio and let some time slip away. 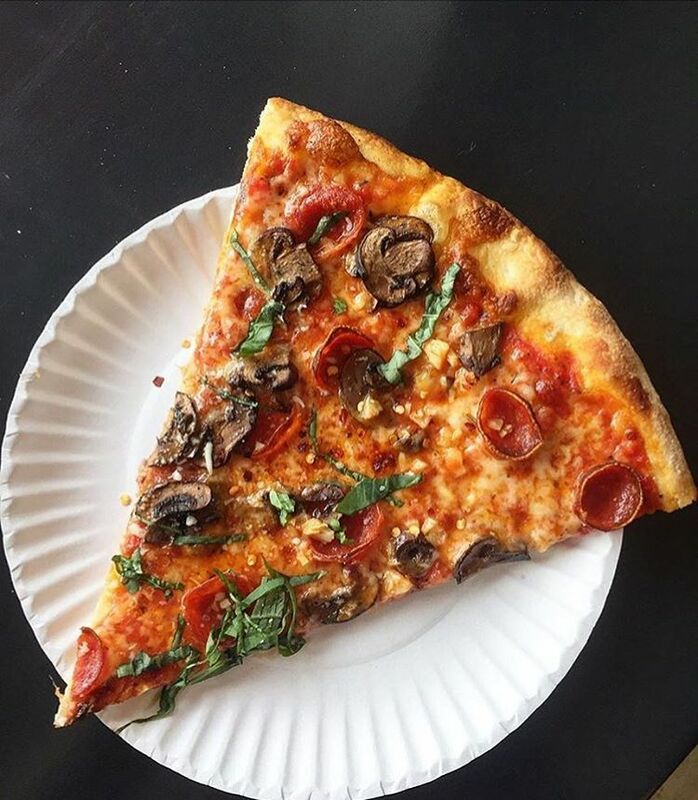 You really can’t go wrong with a New York-style pizza slice or three for lunch and Prime Pizza is tossing up some of the best pies in town. They’re also delivering wings, salads, sandwiches and some heavily discussed garlic knots. We’re loving the slices of sausage-kale, arrabbiata and old-fashioned pepperoni. 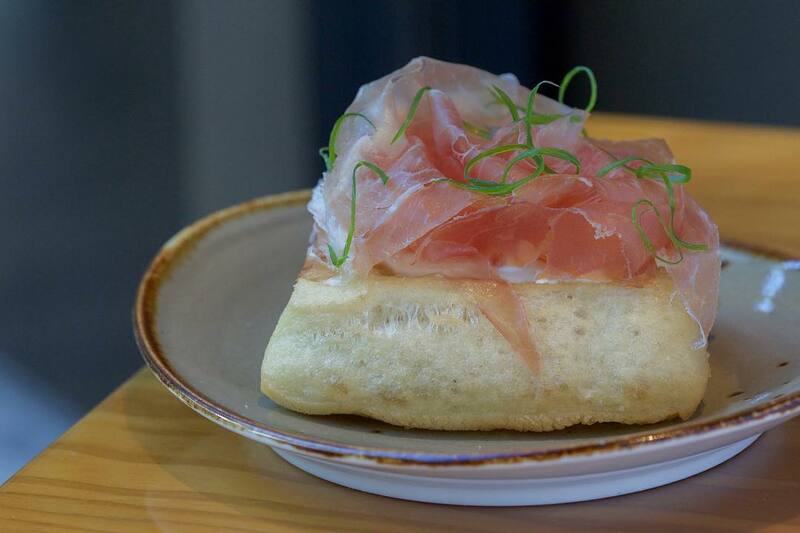 If you’d like to delve deeper into some hearty Italiano, look no further than the hype-deserving Angelini Alimentari. Frittatas and breakfast paninos under $10 are served all day alongside an entire panino menu featuring hanger steak with arugula, old fashioned meatball and chicken with crispy bacon and so on. Salads include a classic Caesar and beets and burrata with walnuts. They also make their gelato in-house on the daily, so if you opt for that for lunch, we won’t tell on you. 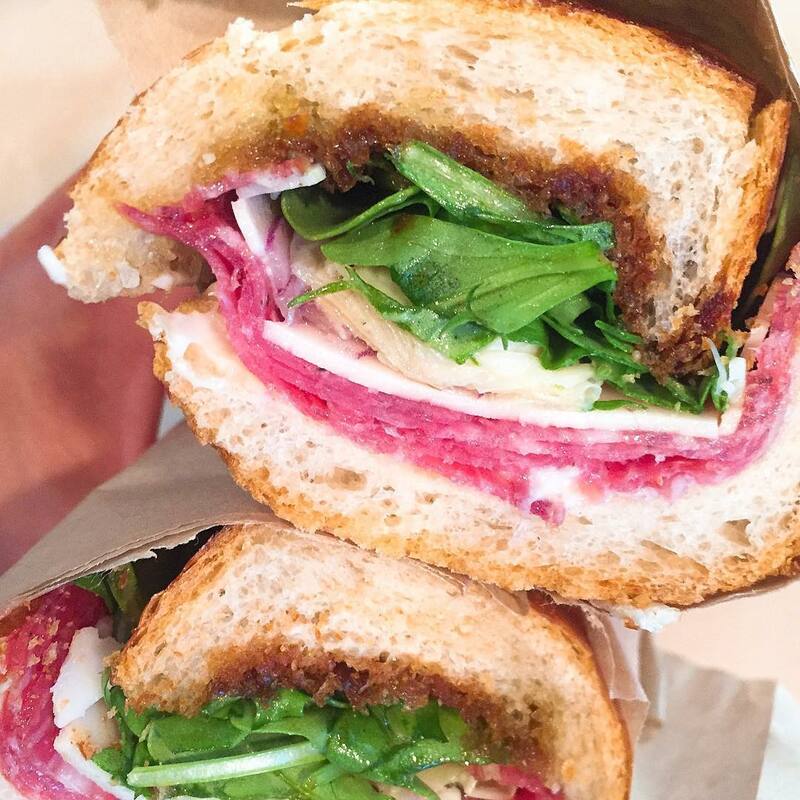 When Chef Michael Voltaggio of Ink opens a sandwich store, you know it’s gotta be good. The Cold Fried Chicken might be the talk of the town, but the frenchy, club, or pork shoulder banh mi are also on the top of our list. 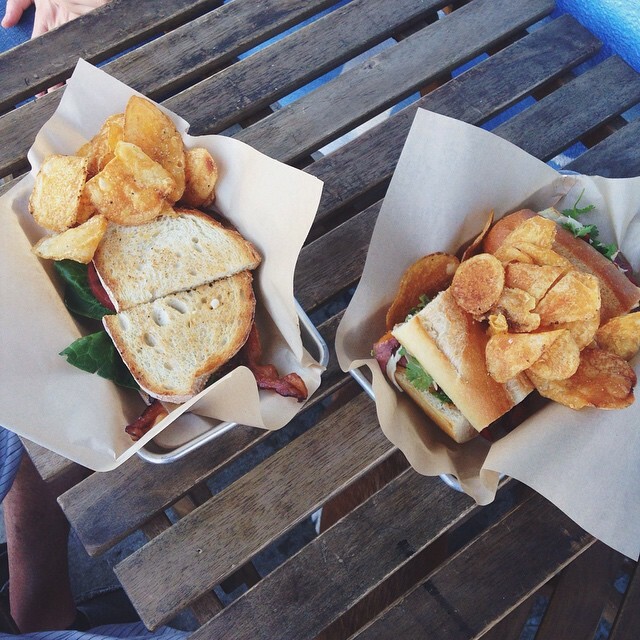 Each of Sack’s sandwiches hover around $6 -$7 which will leave you enough dough for a nitro iced chai or and a bag of house-made chips. One of LA's oldest and most-loved spots to grab a quick, tasty bite. 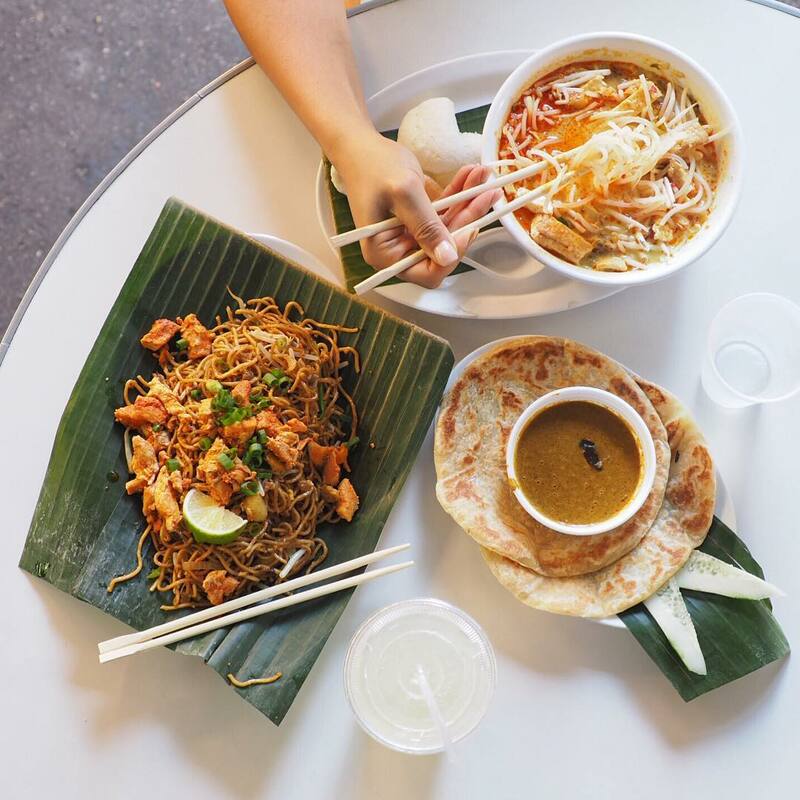 Try out Neal Fraser’s new Fritzi Dog for fried chicken burgers or chicken and waffle; Loteria Grill for authentic Mexican ceviche and tacos, or Singapore's Banana Leaf for Singaporean-style curries, noodles and roti. We all love the convenience of the Chipotle assembly line, but what if you could have the exotic flavors of Southeast Asia instead? At ShopHouse you start by choosing rice, noodles or salad, add meat or tofu, a vegetable, sauce (curry, sweet chili, peanut, tamarind) and garnishes. We implore you to try the crispy spring rolls and coconut rice and mango parfait. 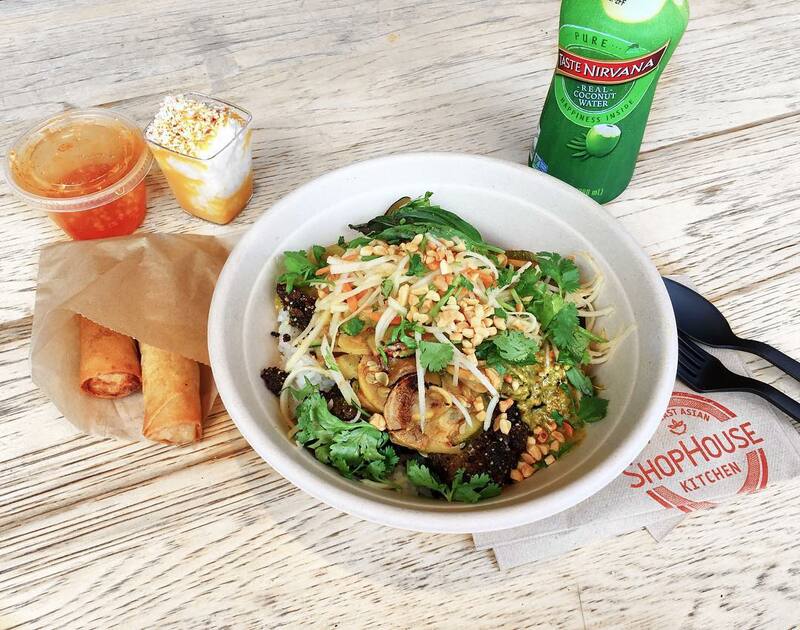 Not so unlike Chipotle, ShopHouse is like crack. Hollywood’s best pizza! And according to our editor, the best pizza in LA. Seriously, we can’t keep her away from this place. Somebody stop her! The dough is fermented for 24 hours in the traditional Roman style and transformed into a perfect personal pizza that will cost you $10 and under for the most part. Whether it’s butternut squash with maple bacon and leek or a traditional Margherita, we’re pretty certain Romana is giving Mozza a run for its money. Aside from the superb coffee, Javista serves up some serious heat in the food department. 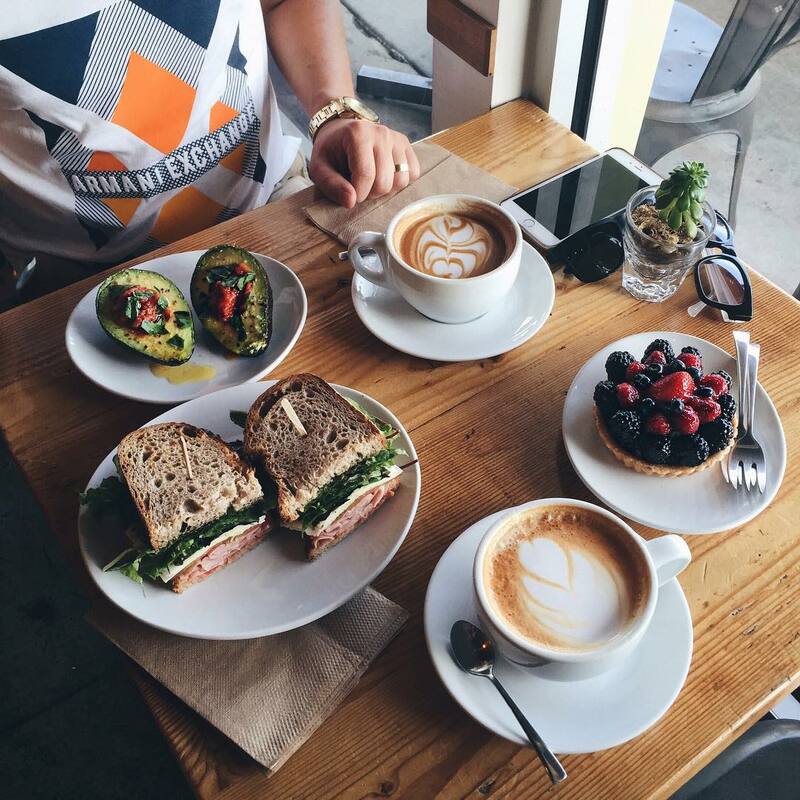 Their signature Avocado Split (Avocado halves filled with bruschetta and basil) is an Instagram favorite, but you can also opt for a rosemary ham or Mediterranean sandwich. 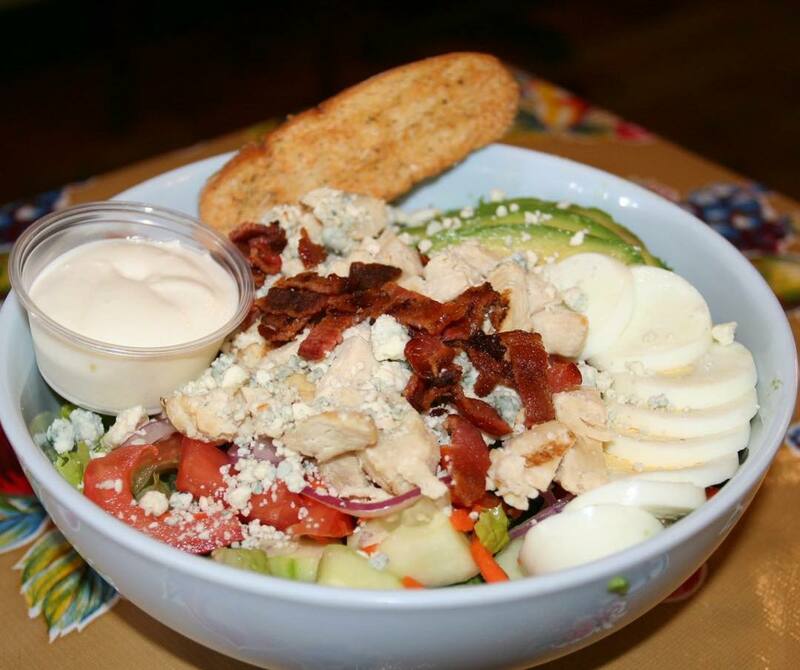 The salads also never leave us wanting more. Vietnamese noodle salads, pho, banh mi and rice dishes are Nong La’s specialty. 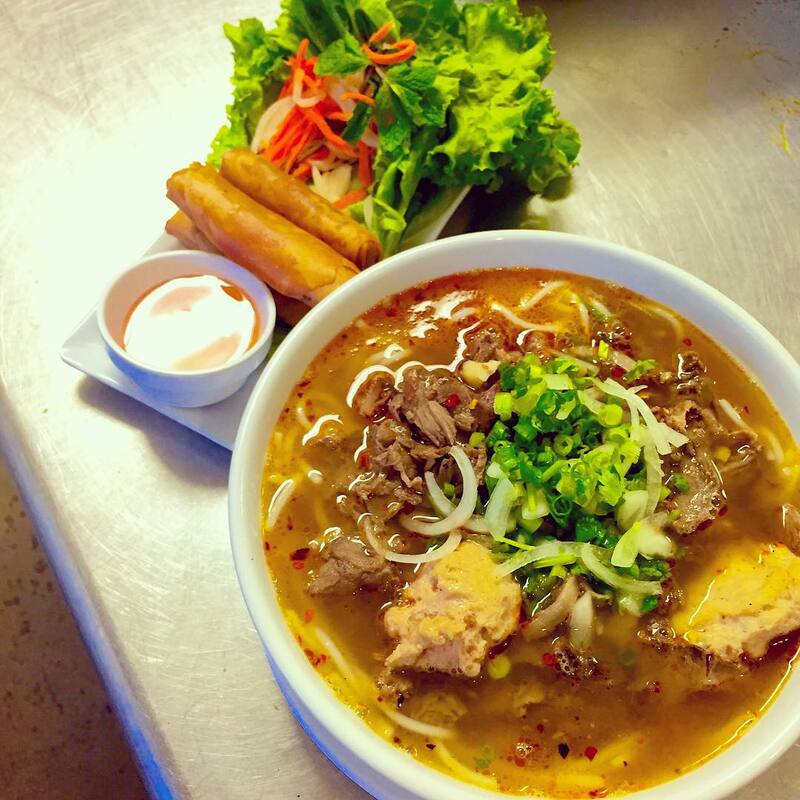 But don’t forget about the Bun Bo Hue—a fragrant Lemongrass beef soup with vermicelli noodles, pork patty and beef, topped with red and green onions and cilantro. Pair that up with some crispy pork and shrimp egg rolls or a clam salad with black sesame crackers and lunch is complete. 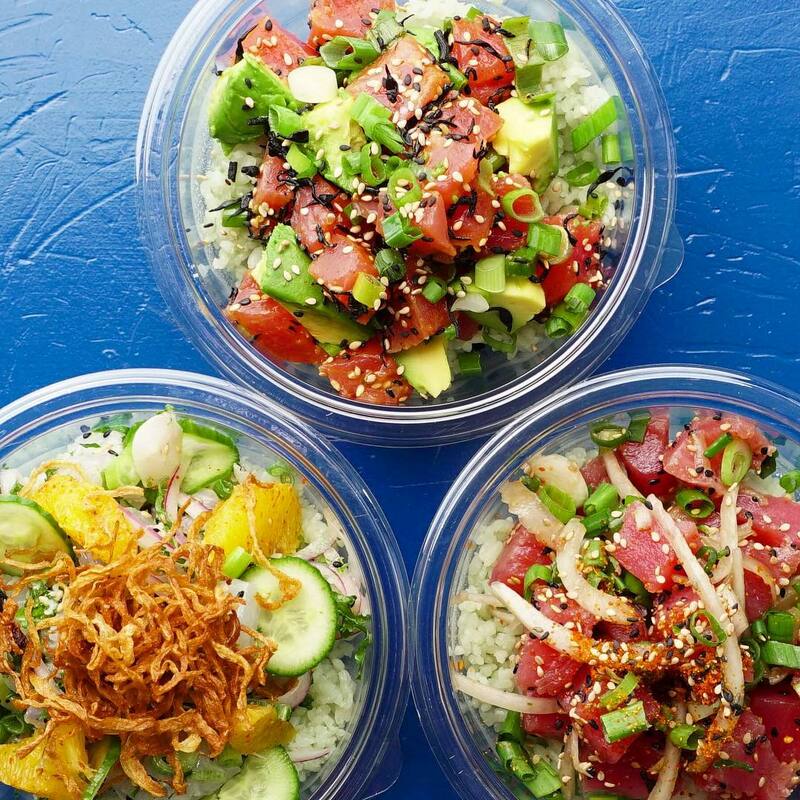 Drift by the office cubicles with an air of coolness and declare, “I’m just grabbing poke for lunch.” Sweetfin puts all other poke places to shame with a wide array of always fresh ingredients, but our favorite toppings are the crispy onions, crispy garlic, mango and macadamia nuts—if they haven’t sold out, that is. 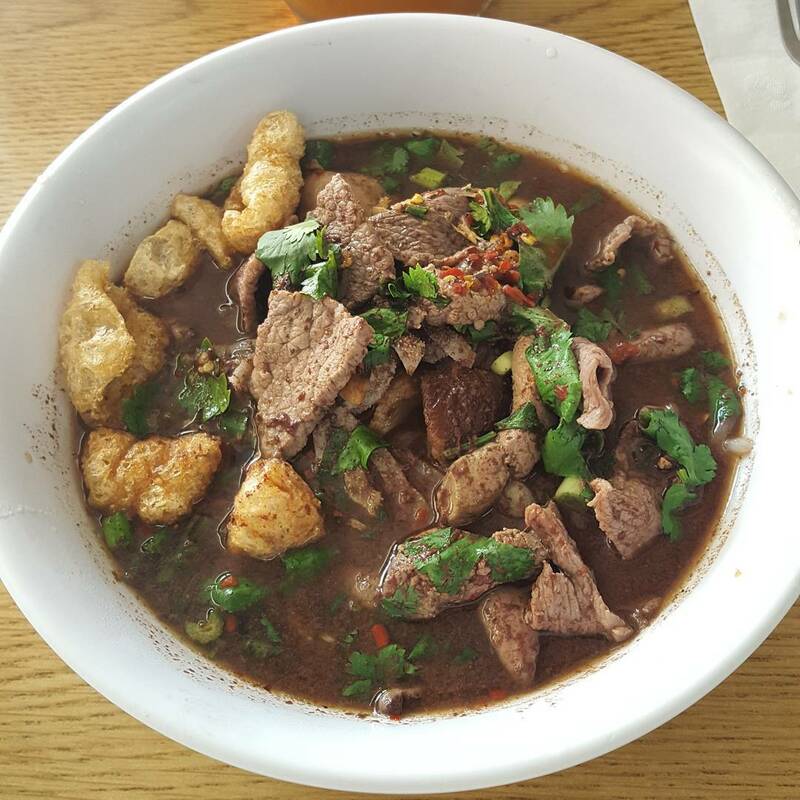 Sapp may be hiding in a strip mall but it’s a beloved LA staple approved by His holiness himself, Anthony Bourdain. Follow his lead and go for the boat noodles or try the popular jade noodles with BBQ pork, roast duck and shredded crab. Being that you’re in a coffee shop, a sweet Thai coffee chaser is a no brainer. Kobawoo is a recurring staple on Jonathan Gold’s 101 best restaurants list. 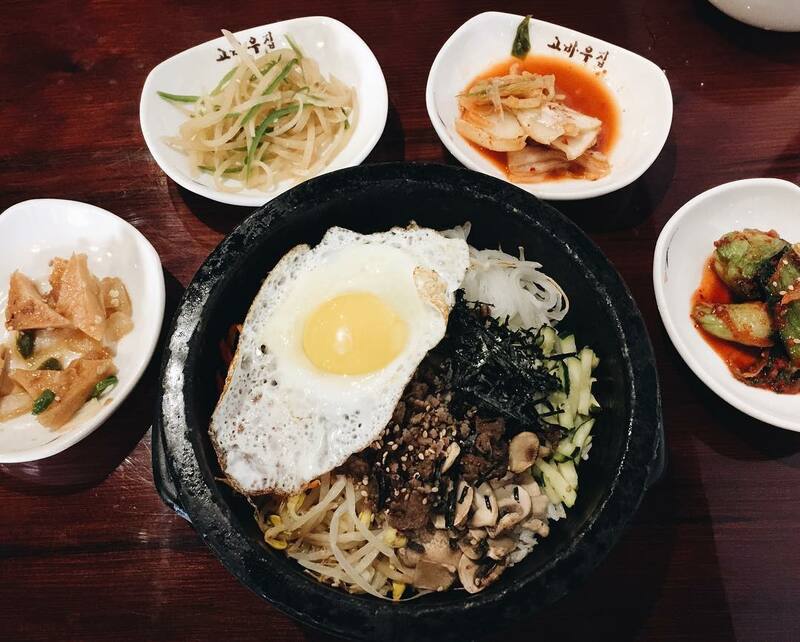 Kobawoo has a solid lunch menu that serves a single person perfectly and includes bosam and miso stew, bulgogi and kimchi as well as sanche bibimbap—rice topped with vegetables and meat served with bean sprout soup. 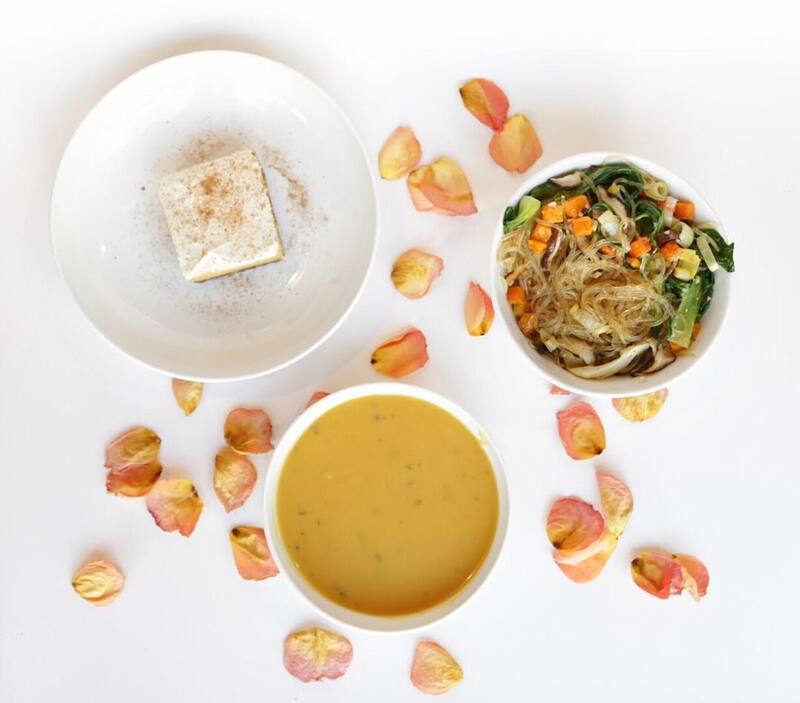 With a load of gluten-free and vegan options like raw zucchini linguini salad or a brie, apple and jam sandwich, Stamp is the kind of place that leaves you actually feeling healthier after you eat. There’s bison meatloaf or a chipotle chicken sandwich for carnivores and you should definitely wash it all down with a Runyon Green Machine juice. 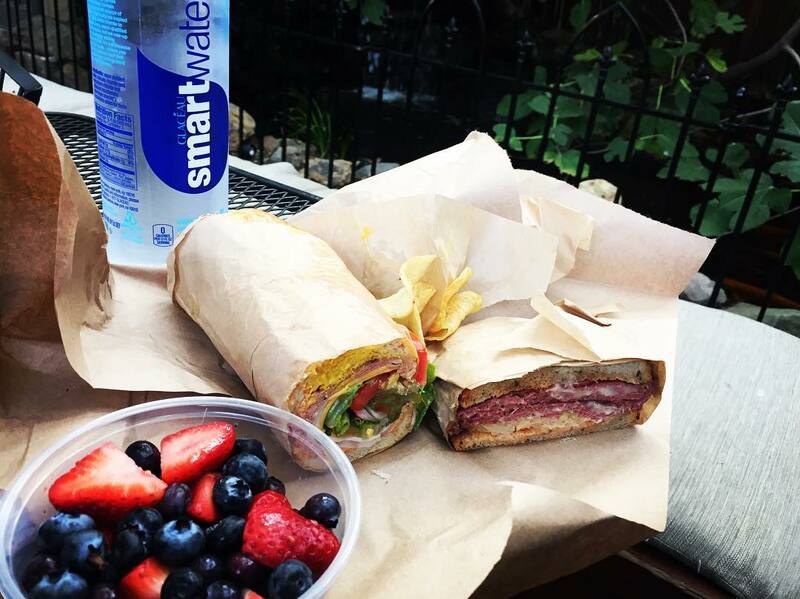 These are the Italian-style sandwiches that help the Eastside protein-load before yoga class. Take the namesake: #99 The Sopressata (sopressata, provolone piccante dop, extra virgin olive oil, aged balsamic, mayo, artichokes, red onion and wild arugula) or for the veg-lovers, go for the #22 Avocado Fontina. 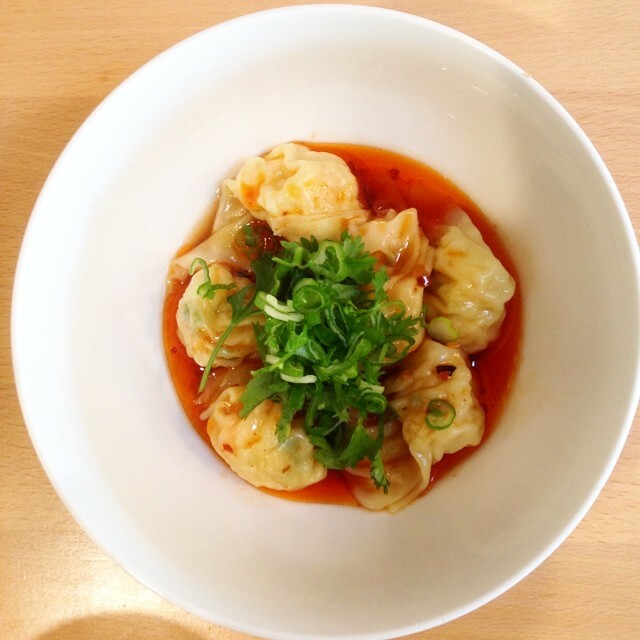 This little Silver Lake gem is inspired by Chinese and Taiwanese style dishes and the small plate menu (all under $8) is perfect for lunch—potstickers, pancakes, spicy shrimp wontons and pork buns—or dip into some beef noodle soup or vegetarian mapo tofu rice. The food here isn’t science fiction but it damn well may be just as enchanting. Lamb sandwiches with lemon turmeric yogurt and marinated onions; pickled beet ciabatta with capers, olives and marinated onions, Bulgarian sheep feta and egg or plates of flatbread with hummus, tabouleh, lamb and falafel. 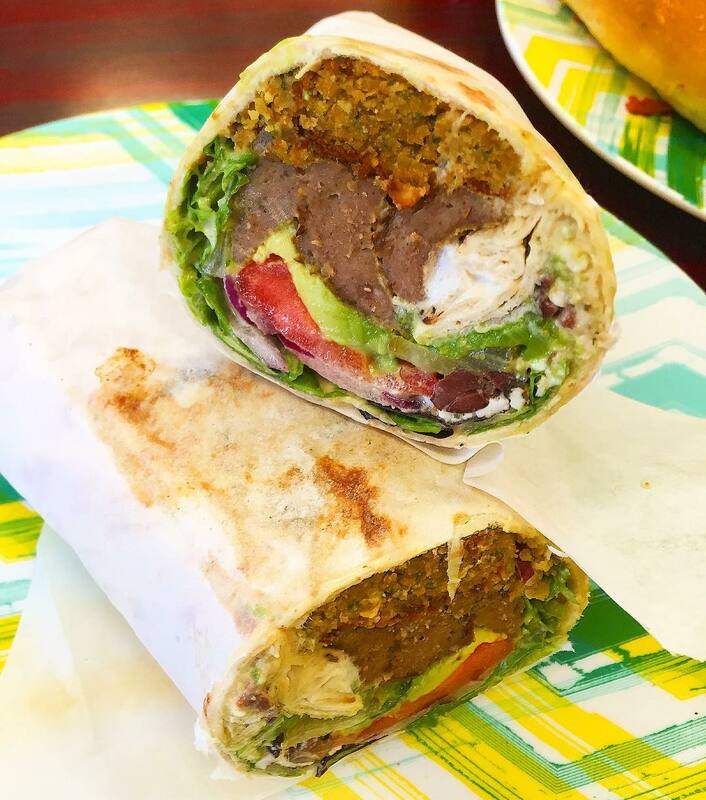 Let us repeat: falafel. 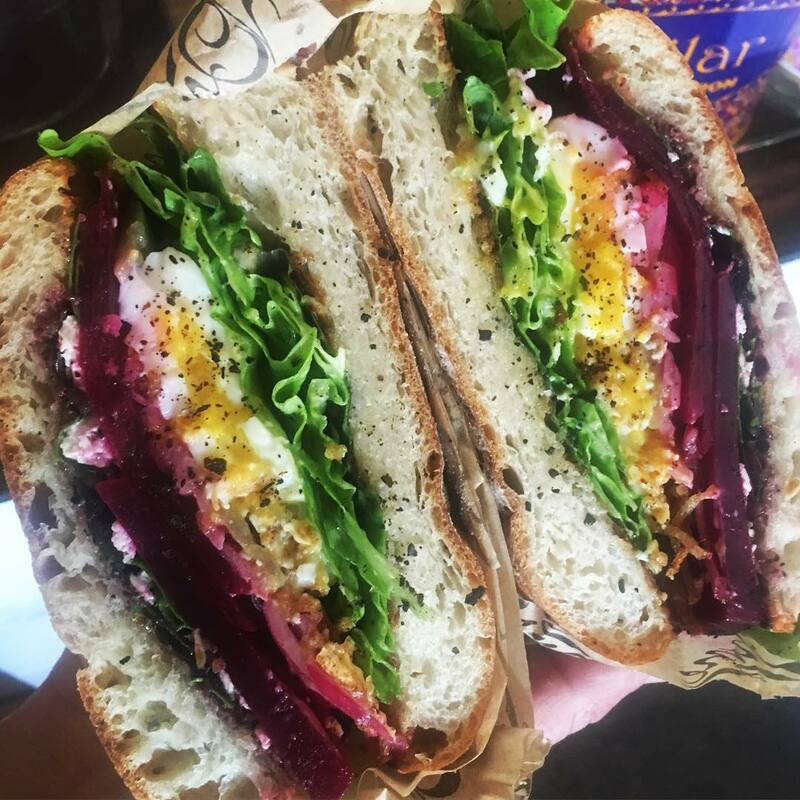 In the Middle Ages a trencher was a plate made of bread, which makes sense when you order a trencher at Trencher in Echo Park. 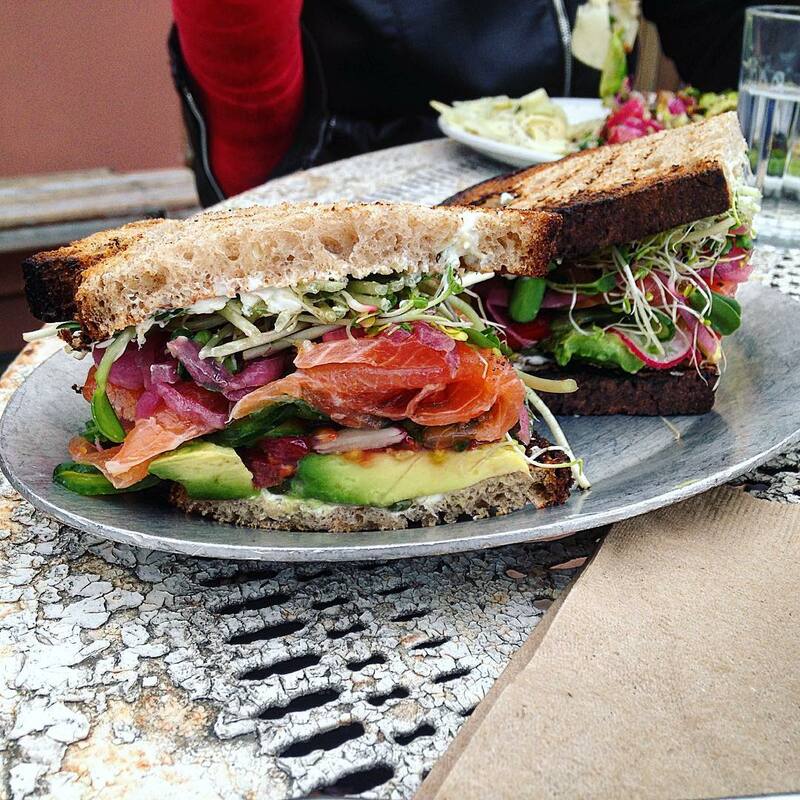 It’s an open-faced sandwich with smoked salmon, avocado, sliced egg, red onions, cucumbers, rosemary aioli on rye. 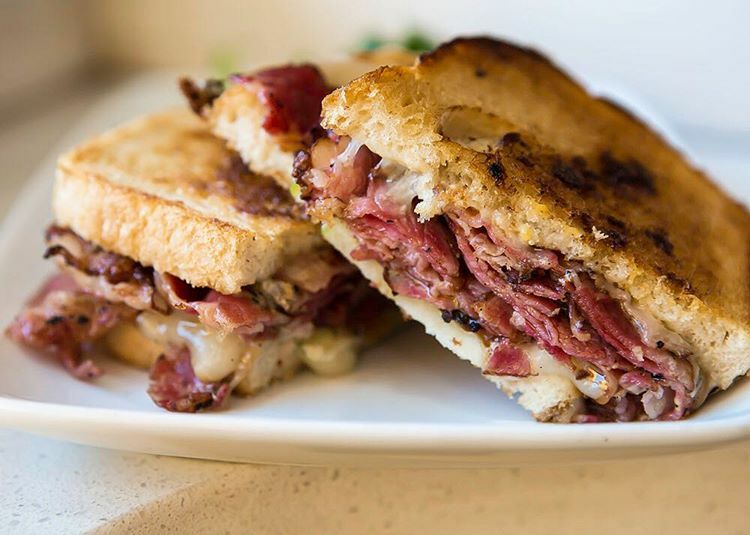 If you prefer your bread squished together, there are plenty of delicious sammies from corned beef to vegan mushroom, all served with a side of crunchy potato chips. Charles Olalia’s Filipino rice and noodle bowls will keep you feeling toasty and loaded with all sorts of flavors you probably haven’t yet experienced, like the Pancit Luglog, shellfish chowder and crushed pork rinds. 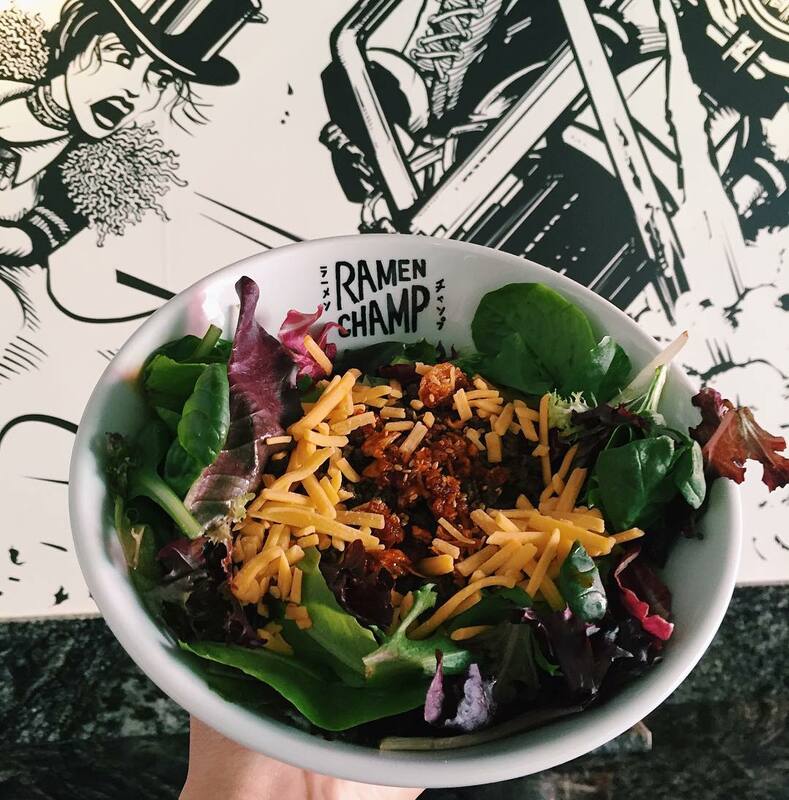 The bowls are tasty as hell and will only put you out eight bucks or so. LA has a plethora of wonderful old delis that you can, and should, check out for lunch. (Canter's, Wexler's, Greenblatt's and Brent's to name a few). But while you’re downtown, we do declare that you must check into Langer’s, the 70-year old icon that knows how to make a proper pastrami sandwich. In fact, hot pastrami sandwiches even have their own menu over here. Perhaps one of the most LA experiences you can have, DTLA’s Grand Central Market has got it all. You really can’t go wrong, but we recommend trying some falafels at Madcapra, sausages at Berlin Currywurst, Bento boxes at Bento Ya, the best egg sandwiches in town at Eggslut and seafood-centric tostadas at La Tostaderia. Sushi hand rolls from Sugarfish’s Kazunori Nozawa at his spin-off KazuNori make for a healthy, quick munch that’s a little easier on your wallet. 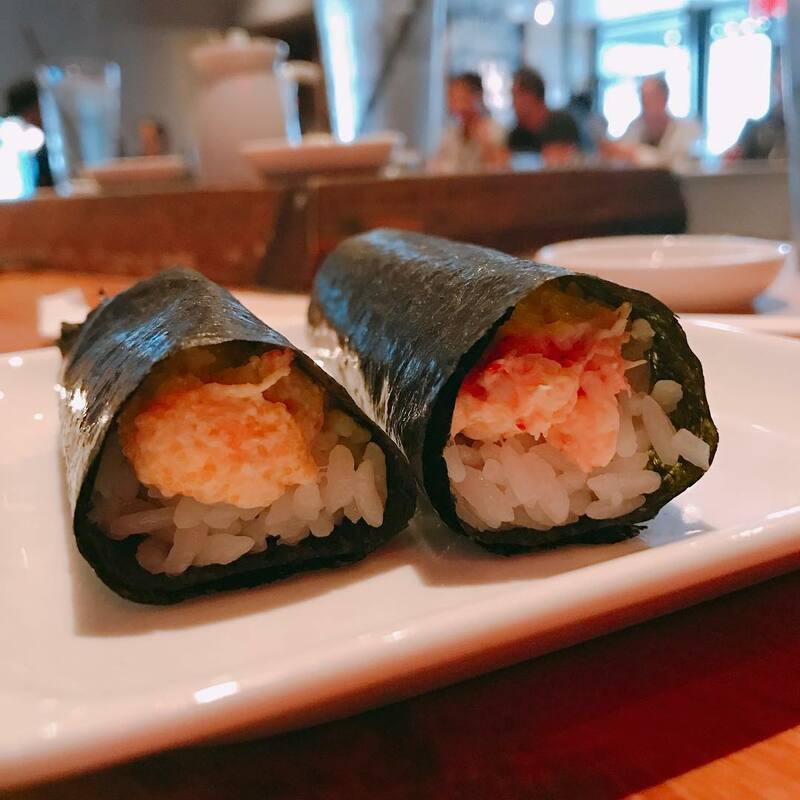 You can select your own filling or opt in for a “set” menu like the 3-hand rolls for $11 that feature salmon, scallop and blue crab. 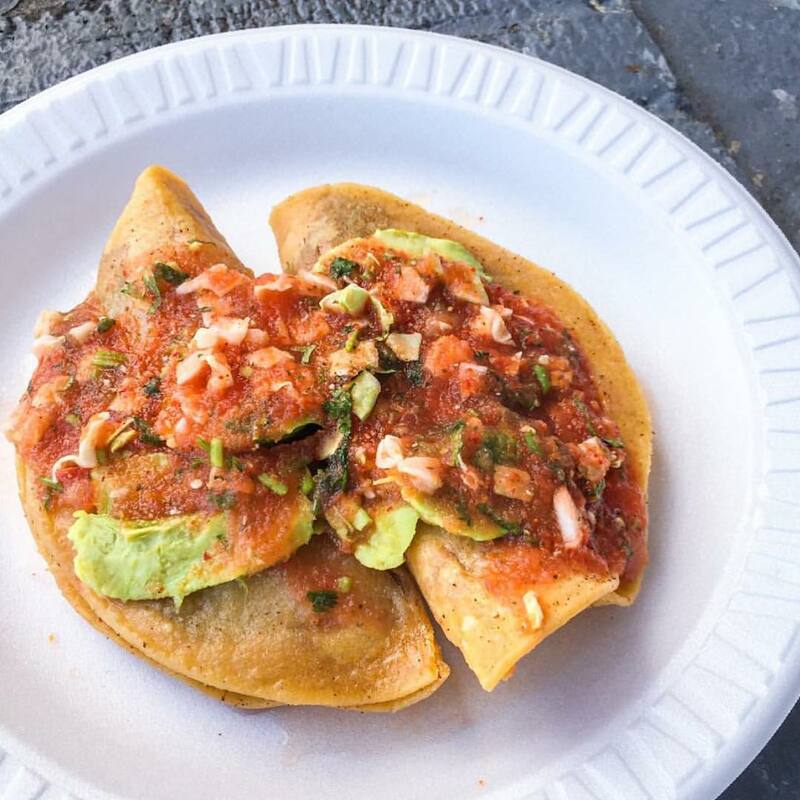 Heralded as the best crispy shrimp taco in Los Angeles, Mariscos Jalisco is a must hit for all of us.Shrimp tacos are just $1.75 a pop, and ceviche tostadas are just $2.50. You know what that means? Five of everything! Specializing in the “press”, PressEat offers small and large subs and burgers, pressed! All of their meat is 100 percent kosher. No animals for you? Well, they’ve got a vegan burger … and it’s pressed too! There’s even a pressed croissant filled with strawberries, banana and Nutella. At this cozy, old-style cafe, shelves are crammed with books, and wicker baskets and chairs hang from the ceiling. Just sitting here will transform your day for the better. There are old-time sodas and sundaes, but also a large menu of salads and sandwiches all under $10. Sandwiches with a Mediterranean spark, Hy Mart offers veggie wraps, carnivorian wraps, subs, pitas and a variety of unique salads, all under 10 bucks. 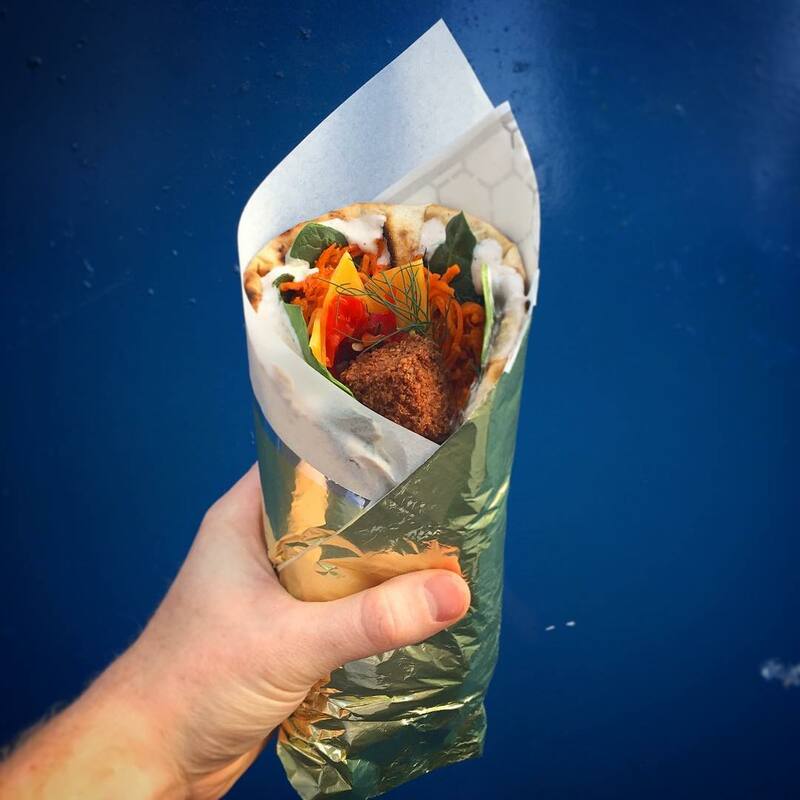 The Gyro Gone Wild wrap features gyro meat, falafel, hummus, tomato, onions, olives, avocado, feta, tzatziki, tahini, (breathe …) mint, basil, olive oil, lemon and pickles. Oh my! What’s not to like about steaming hot empanadas crammed with the likes of quinoa, lentils, pinto beans, rice, chile con carne, chicken and biscuits? 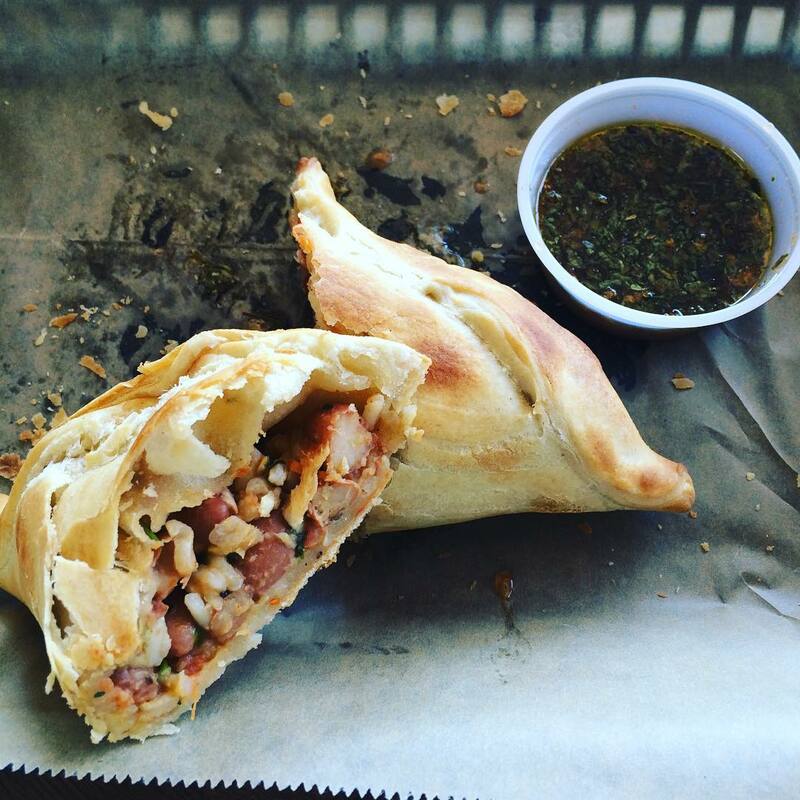 The options are aplenty so we could easily roll through World Empanadas more than once a week. 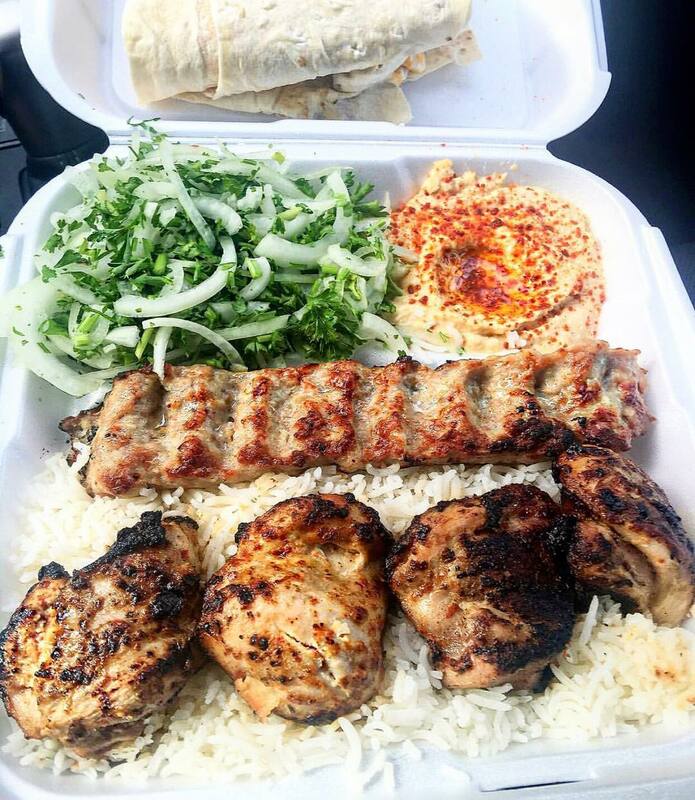 It may be itsy-bitsy but this family run hole-in-the-wall has a mighty rep, named frequently as one of the best kabobs in LA for almost thirty years! Beef lule, beef shish kabob, chicken breast, chicken thigh, falafel and lamb, all served with basmati rice, fire roasted tomato, jalapeño, and hummus. Cash only! The delicate sounds of jazz music permeate the air as you chow down on your Big Band sandwich filled with turkey, pastrami, roast beef, mustard, mayo, cheese, pickles and jalapeno peppers. Perhaps with a side of nachos and cheese. There’s also a tasty hot dog menu (all under $4.50) that can even be substituted with veggie dogs. Sounds like a chill spot to camp out on your free hour. 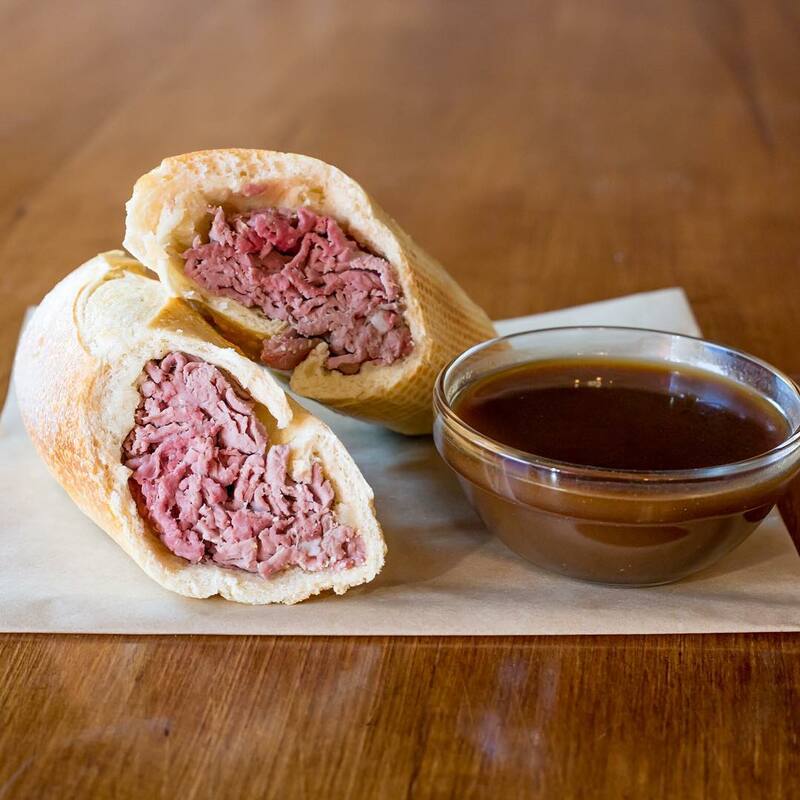 Every Tuesday evening there’s live jazz from 6 - 8 p.m.
French dip! Braised lamb, slow-roasted pork, turkey with bacon-turkey au jus and garlic parmesan butter … we’re drooling just thinking about Harlowe’s. Especially when the price tag is pretty much $10 and under across the board. So now that you’re staying, you should also adopt a side of Salt Brine fries to call your own. A gourmet cafe without the price tag, Braise & Crumble never leaves us hanging. 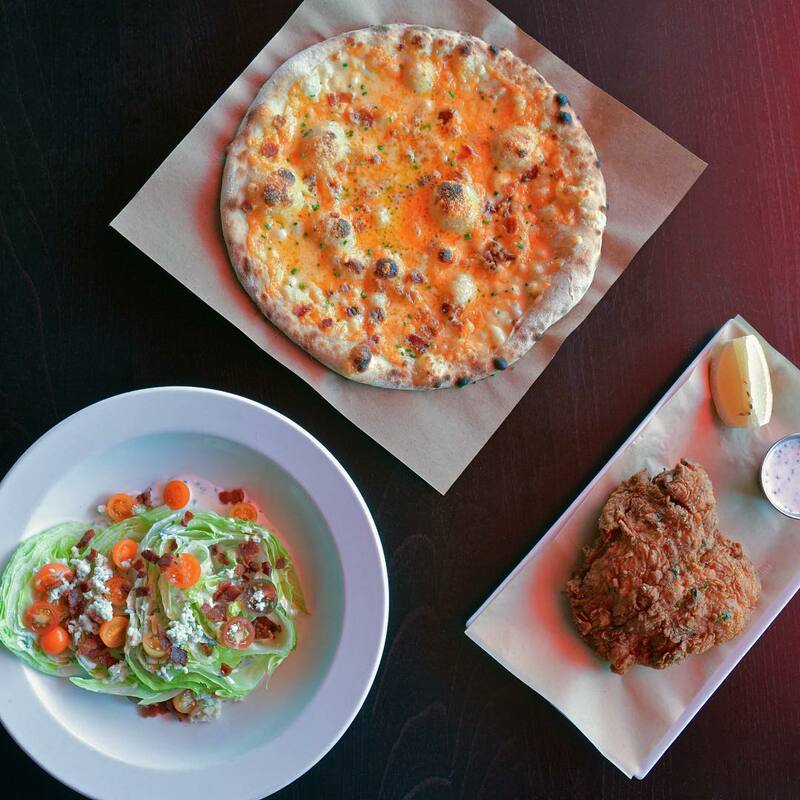 Choose betwen the likes of short rib tacos, garlic veggie rolls, fried chicken and biscuits, cups of chili, gorgonzola potato salad or bacon mac 'n cheese. Then, grab a 4 Bite Apple Crack Pie for dessert. A passionate mother and daughter team, Pencil offers a cafe experience that’s both homey and inviting. 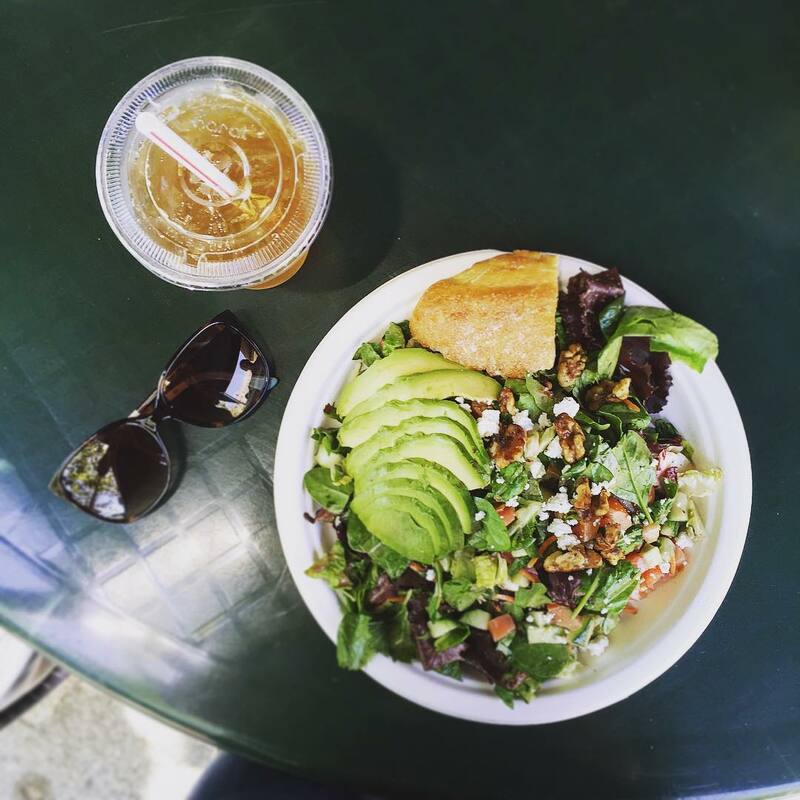 It’s your classic sandwich-salad spot with fresh smoothies and all. Try the turkey cream cheese or the egg salad with basil. Belinda Gosbee is an Aussie writer, actress and coffee snob based in Los Angeles. Follow her jaunts on twitter @belindagosbee or Instagram @gos22. Modern, stylish eatery & shop for gourmet entrees, soups, sandwiches & more, plus beer & wine. 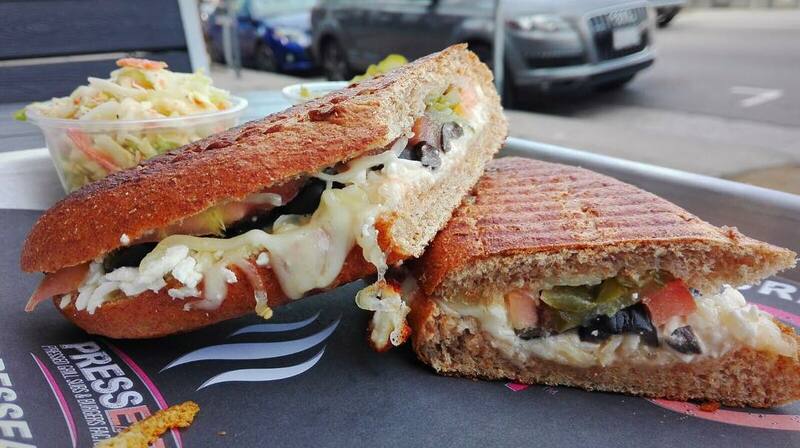 Basic spot lets diners choose the ingredients for an array of sandwiches & salads. This hip eatery with free parking & WiFi offers breakfast, sandwiches & salads on 2 outdoor patios. Counter-service choice for burgers, sandwiches & breakfasts, many with healthy spins, in retro digs. Low-key choice for salads, wraps & sandwiches in a casual & convenient setting. Charming neighborhood market features groceries, produce & homemade deli fare, with patio seating. 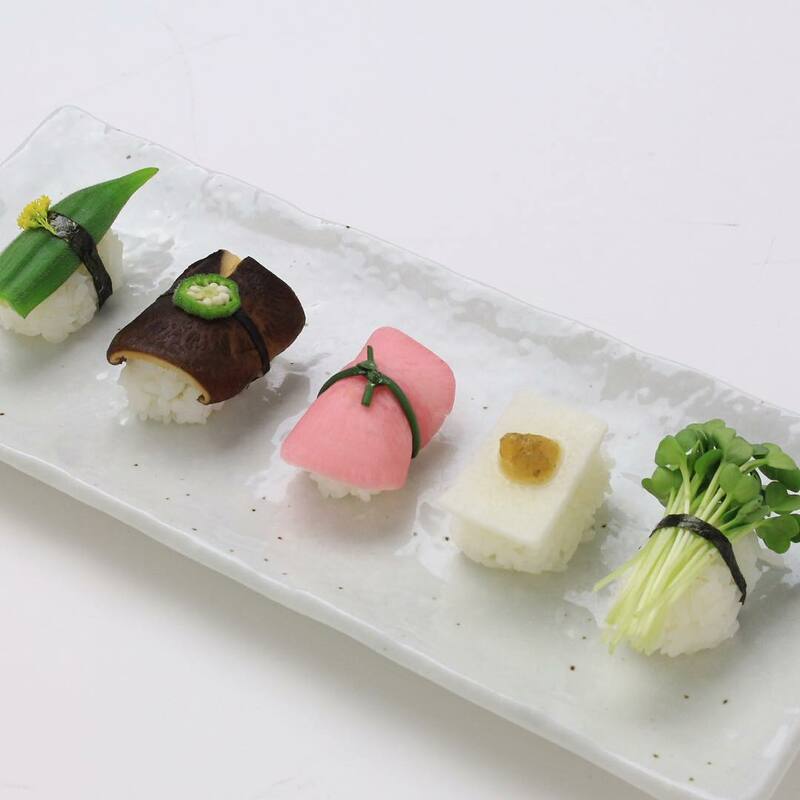 Misasa has a full line of Japanese classic dishes. The Donburi menu uses high-quality natural eggs to enhance the flavor. No-frills branch of a Japanese chain offering multiple variations of the traditional noodle soup. First American branch of a popular Tokyo tempura specialist, in the Mitsua Marketplace food court. A heatlhy Japanese noodle shop in Mar Vista. Health-focused option for cold-pressed juices, smoothies & raw foods in a bright, modern space. Old-fashioned space for classic, 20-inch pizza pies, garlic knots & salads. No-frills, pint-sized counter serve offering a variety of gourmet sandwiches & organic milkshakes. Innovative takes on classic Mexican eats are the hallmark of this Original Farmers Market stand. Tiny farmer's market hub for Far East fare, including curries & skewers, served on banana leaves. Inventive grilled cheese sandwiches are spotlighted at this contemporary counter-serve eatery. Counter-serve chain offering a range of Southeast Asian ingredients for mix-&-match bowls. Don't tell Nancy we said so, but Pizza Romana has the same quality taste as Mozza at half the price. The devil is in the doughy details and this pizzeria spared no expense by importing the flour and Nepalese wood fire oven. We love the plain ol’ Margherita and don’t sleep on their spicy fried chicken sandwich for a change of pace. Compact Filipino eatery with a 7-seat bar specializes in grain bowls & modern takes on classic eats. 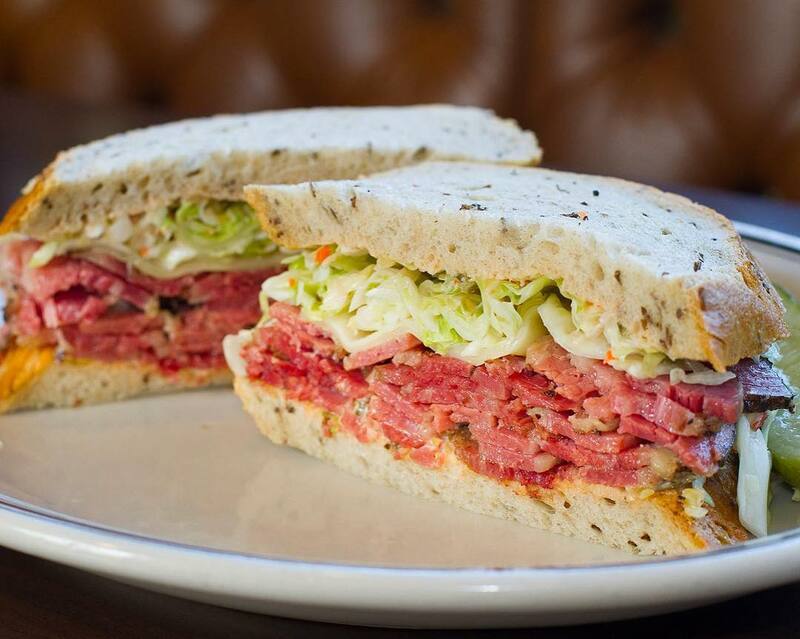 Landmark deli offering a huge variety of hearty sandwiches & baked goods around the clock. 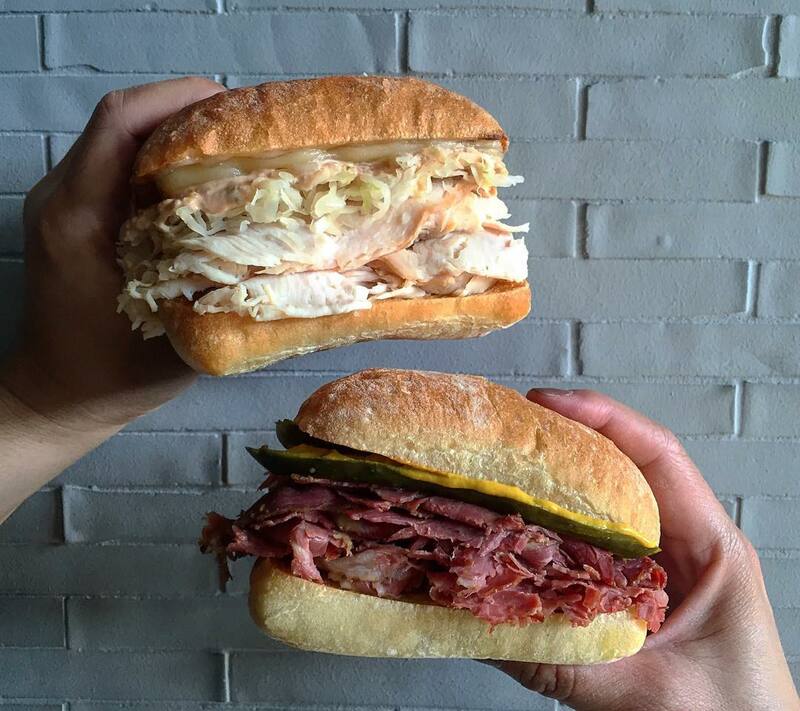 Compact old-school, new-wave deli offering bagels & sandwiches filled with house-cured meats & fish. Old-school place with a traditional deli & fine vintages at an attached retail wine shop. Bustling deli doles out sizable sandwiches & other classics along with an all-day breakfast menu. One of a nothing-fancy counter-serve trio specializing in German sausages with curry sauce. Bento boxes and other Japanese dishes in the Grand Central Market. Tiny space inside Grand Central Market specializing in seafood-centric Mexican fare & tostadas. No-frills Mexican food truck offering cold seafood dishes, shucked oysters, cocktails & more. Casual, modern eatery serving pressed burgers & subs, plus salads, sweets & all-day breakfast. Cozy counter serve selling espresso drinks & sandwiches in an old-fashioned, country store ambiance. Longtime mom-&-pop establishment selling Mediterranean-inspired sandwiches in a modest space. The Carving Board is a place where great ingredients and unique ideas meet. Bread and cookies are baked fresh, and high-quality specialty meats are roasted in-house. Family-run outfit offering savory, sweet & vegan empanadas & housemade salsas in a cozy setting. Unfussy, longtime family-run Armenian spot for kebabs & salads in a tiny, no-frills storefront. Centered in historic Old Pasadena, CA, the handsome wood Art Deco interior of Harlowe’s French Dip surrounds and transports you back in time. 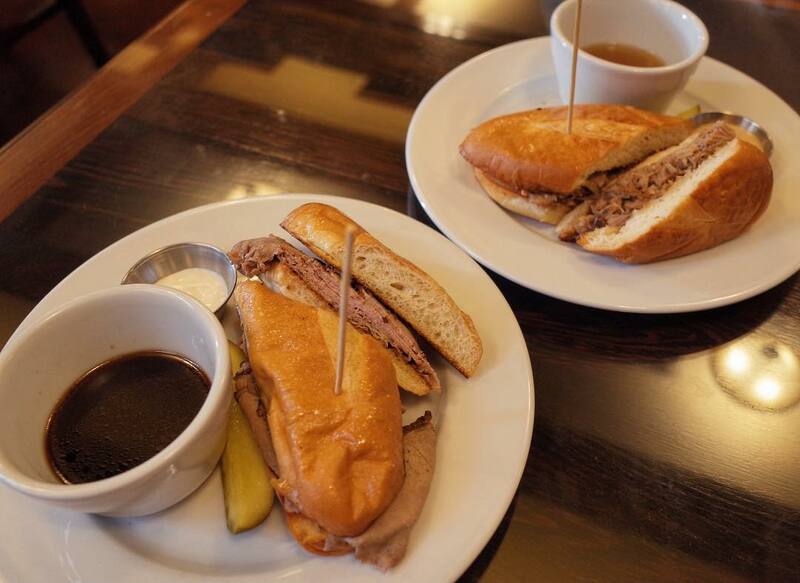 Harlowe's is more than French Dips: it's an ensemble of signature sandwiches and upscale pub fare. Pencil is a community-oriented, family-operated, sandwich shop and cafe. 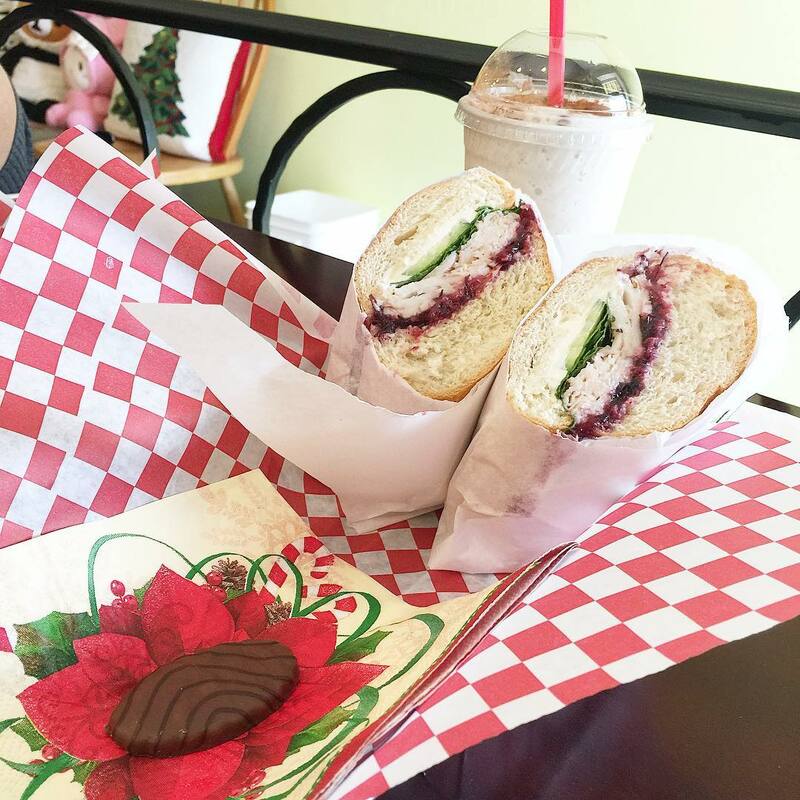 They offer healthy salads, unique sandwiches, and specialty drinks, all created in a warm and inviting atmosphere. This intimate 22-seat counter-serve noodle specialist serves up steaming bowls of creative ramen. A simple restaurant with all the familiar Vietnamese comfort foods.